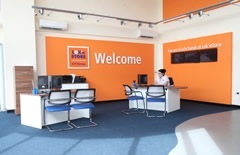 Lok'nStore has self storage centres in many other locations, the closest being in Sunbury. This store is located in central Woking just a few minutes walk from the Railway Station with convenient access from the A320 Guildford / Chertsey Road, A3 or M25. Approaching from the M25: Leave at junction 11, taking the A317 exit to A320 / Woking / Chertsey. At the roundabout, take the 1st exit onto St Peter's Way / A317. At the next roundabout, take the 1st exit onto Guildford Road / A320.Continue to follow the A320. Go through 2 roundabouts. At the next roundabout, take the 2nd exit onto Monument Road. Turn right onto Maybury Road. Turn right onto Marlborough Road and you will see our big blue building on your right hand side. Lok'nStore Woking in Marlborough Road provides storage for all business and household customers in the Woking area and beyond, with the same friendly, secure and low cost service that you would expect and receive at any of our other facilities. Although this is one of our smaller stores it still has over 235 private steel storage units, ranging in size from small 12 sq ft lockers, up to huge 740 sq ft units for pallet storage and many sizes in-between. Our secure storage facility in Marlborough Road used to be a parachute factory – come and see if you can spot one of the original features! Lok'nStore Woking also serves customers from Addlestone, Bisley, Brookwood, Chertsey, Goldsworth Park, Guildford, Ripley, Send, Surrey, and West End. A member of staff says: “Working for Lok'nStore is all about customer service. We make sure our customers get the right size space for their possessions. 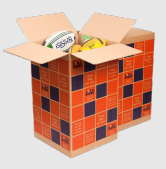 Stored in a dry, safe and secure environment at the lowest prices in Woking - which cannot, and will not be beaten! We will go the extra mile to help you, and just when you need it there is a friendly smile and a cup of coffee or tea waiting for you in our reception area.” The closest alternate Lok'nStore location to this store is Sunbury. What does storage at Lok'nStore Woking cost? Prices for storage vary, depending on the size of space / unit that you need, how long you want to store with us and your chosen method of payment. Please call the centre on the phone number displayed above and to the right for a quote for storage or more information on our services. All prices include VAT.